Happy new year! here are the megagames I am planning to run or design in 2019. Den of Wolves is essentially Battlestar Galactica, minus specific IP such as robots with bouncing red eyeballs, with a focus on the politics of the survivor fleet and crisis management. Click on the heading to go to the event page for the game blurb and some links to after action reports from games in the UK. Den of Wolves is an experiment in using an off the shelf design, and then not hacking the rules! I do have some plans for adding some elements to the game that players can riff off in their roleplaying, but I do not intend to alter any of the mechanical elements of the game. This is also the first time I have run a game in Wellington without piggy backing on a convention, so the cost of the game includes venue hire, as well as production and licensing costs. As we already have players coming from Australia and Auckland, I am hoping for a good local turnout as well. Tickets for Den of Wolves are on sale here. Unwaged or Control $15, Waged $30. There is a $5 price rise on 19 January 2019. 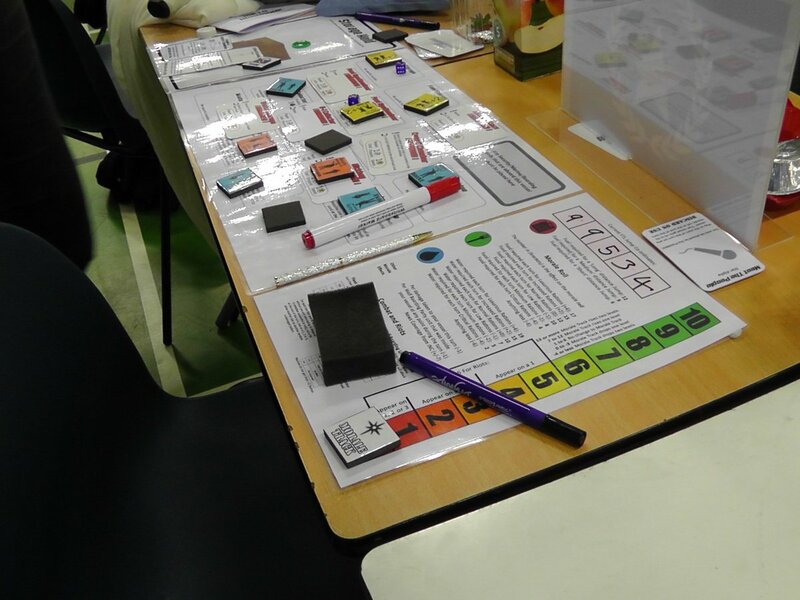 Photo from South West Megagames, of the three sheets used to control one ship in Den of Wolves. A complete revision of the second version of the game. This is likely to be what I run at Wellycon. In the first Act of the game, all player versus player options are disabled. This is a learning phase of the game, during which Atlantis will expand over a map of the Mediterranean and adjoining lands with 60+ significant cities. In the second Act of the game, the player versus player options are enabled and both players and factions can be exiled from Atlantis. In the third Act of the game, we will find out if earlier player actions mean Atlantis is likely to suffer a deluge or not. The Tyrants, a faction that seeks to make Atlantis great again. Trader – as well as playing an economic role for the team, the trader is also the team spy. During the game, players will have the option to spend time performing hero quests based on Greek mythology. This might happen if you are exiled from Atlantis for a turn, or if your team chooses to send you off questing. Questing can result in both great rewards and tragic complications. Revisiting one of my best games, which was originally run down in Christchurch in 2006. The premise was a lost colony, settled by peace and nature loving hippies, which had gone through technology collapse, balkanization, warfare, and then recontact with the rest of humanity. The original Flower Power game was essentially a world war two scenario of mass industrial warfare, with some drug smuggling and COMINTERN intrigue on the side. It definitely resonated with many of the players, who still reminisce fondly about the game today. I now think the best frame for revising the game is to focus on contemporary issues of fragile states, peacekeeping, and counterinsurgency that we see happening around the world today. Where many of my past megagames have involved teams with relatively equal amounts of power and options, Flower Power II will feature factions with asymmetric power levels and options in the game. Insurgent factions derived from former local governments, spanning a range of ideological positions, and tactics from non-violent protest to terrorism. Today my design thoughts have focused a fair bit on how I might improve Colossus of Atlantis through simple changes to the sequence of play, and how the last turn of the game could be handled. This is the sequence of play that I used for the two games of Colossus of Atlantis this year. It starts with the Map Phase, and then players take information and resources from the Map game to their team, where they can exchange resources and make future plans. This is then followed by the Council Phase, then some free time for diplomacy, snacks, and bathroom breaks. The intent was for a game turn to take 50-60 minutes of play. This extends the turn sequence, but it creates an explicit phase for feedback from Control to the players about the DOOM score, plus any other important game announcements, and could also be an opportunity for player speeches and roleplaying. I think this makes a game turn definitely around 60 minutes long. So this puts the team planning phase at the start of the game turn. Because the Council Phase follows the Team Phase, I expect player discussions to focus on potential Council options and decisions. So team options should focus a fair bit on allocating resources between members for effectiveness in their role Councils. The Council Phase is now between the Team and Map Phases. Because players now move from the Council table to their Map table, it should be intuitive for the players to be responsible for conveying Council decisions to their map tables. So a lot of the Council option choices should be reworked to be relevant to the map game. Seattle Megagames added an Assembly Phase every third turn of the game, with half an hour or so of speeches, roleplaying and voting. I would like to try having an Assembly Phase every game turn. Because such a phase often involves one player or Control on broadcast mode to all the players, it can overlap with free time to some extent (as can the DOOM phase that follows). or using the most authentic form of voting by placing coloured stones in an urn. There are two important forms of privilege to consider here – who is allowed to vote on a motion, and who is allowed to speak on a motion. Is this privilege gained at the individual, team, role, faction, or office level? Lots of different ways for it to be done. There is also an opportunity in here to work in the traditional forms of government that warred for control of Ancient Greek city-states: Democracy, Oligarchy, Monarchy, and Tyranny. If we follow Plato, then Atlantis starts with a Monarchy where only the Kings and Queens vote on matters. But then we can give all the teams goals to change that status quo to other forms of government. I had a bit of a crazy idea for approaching the Last Turn of a Colossus of Atlantis game – why not completely change the rule set for the final turn? This reworks some of the options earlier in the game – do you take an option that improves your next game turn, or do you improve your team’s position for the last turn of the game? It also means that for the lucky players who “have it all” in terms of meeting initial objectives and power build up, still have a goal to work towards. So what could we do in that last game turn? First, how about a battle in the streets of Atlantis? Something like the Coup phase in a game of Junta, with the different factions fighting to control the various Palaces and Temples in old Atlantis, or to pilot the titular Colossus of Atlantis itself? A variant on this could be to still run the regular map game, but to add the option of sending some of your units to join the battle for Atlantis. Second, have another mini-game for the various Megaweapons and Megaspells. This would involve offensive and defensive options, with the potential for exploding cities and sinking continents. Third, we could have the struggle to get one of the last seats on the Great Ark, for the players who are certain the first two mini-games are likely to result in the Doom of Atlantis and the great deluge striking. I am happy to entertain other suggestions. Over the last month, Seattle Megagames have run The Colossus of Atlantis on two occasions. This was a milestone for me, in that its the first time I have been paid a license fee for the use of a game I designed (I have in the past been reimbursed part of the cost of running a game at a convention). They have been kind enough to share some feedback on their games. The first game was run with a set of game components close to the version of the game I ran at GENCON 2017. The second game made quite a few changes to fix problems identified in the first game, changing a lot of the cards and council options, and also added a major assembly phase every three game turns. Apparently a lot of the players had an improv background, so the chance for speeches and roleplaying helped make the game fun for them. Feedback to the players on DOOM and Kudos totals, and other game announcements (I think an ideal set up is a combination of whiteboards, projector screens, and a PA system, plus making someone on the Control team, or a player role like Media in Watch the Skies, responsible for feedback). Oaths are not getting much use (In my games they have only been used two to four times per game. I put oaths in the game for thematic colour, and to allow an option for player creativity. They are a bit fiddly in terms of creating a conditional effect that needs to be tracked by players/Control, so a simpler approach is to encourage it for roleplaying, but drop it as an explicit game mechanic). Call the small Colossi units Automatons, make it explicit that the “hero” token is a giant Colossus being piloted by the player’s character in the game (sounds good to me, the Automatons could be thought of as a range of small size steampunk machines, such as submersibles, flyers, rapid fire siege engines, autoplaying bagpipes, etc). Attacking foreign empires and Atlantean cities should be harder and provide more meaningful rewards. Only having one type of reward for each type of region, Land = Arete cards, Coast = Orichalcum, Rival Empire = Vril. This makes admin easier for Control, and should be easier for players at the start of the game. Kudos cards come from battle victory, DOOM tokens from battle defeat. Trying to make combat easier to run. With only one unit counter per unit type, most units roll 2d4 in appropriate terrain (e.g. Triremes in Coastal regions) or 1d4 if not. The Colossus unit rolls 1d13 and 1d4. Make upgrade power cards great, but one use. Make wonders good (but not great) and multi-use/permanent. Plan by playing Arete cards and DOOM tokens face down in options (one minute timer). Start on top left and work clockwise (i.e President first, DOOM last) to resolve. All players reveal Arete cards for an option. Highest value of card + DOOM tokens wins the option. In the planning phase, spend resources to improve quality (pictures indicate resources you cannot spend to upgrade quality). In combat, if you have a higher quality type of unit (e.g. your Hoplites are the best, even though their Triremes are better) then upgrade a Chaos die (d4) to a DOOM die (d13) (so if the Hoplites were in Land, they would now roll 1d13 and 1d4, elsewhere 1d13 rather than 1d4, while a high quality Colossus will roll 2d13). City defence quality is added to other units present and defending the city. I have had a stimulating couple of weeks working on some ideas for Colossus of Atlantis II. One goal for the redesign is to have a better tech tree. Last time the research game was “go fish” in the card deck, followed by “collect a set” trading, and for some of the teams, eventually building a colossi or two. I think I can do better next time. Ideally I want every team to have the chance to put Colossi on the table in time for them to make a difference. I am also keen to move away from people holding large piles of cards for trading – I want trade negotiations to focus on a contract like piece of paper where people haggle over the split of profits. Tech trees have always been a staple of RTS games, but they go back further, to the old Civilization boardgame (1980), if not earlier. Is the research order set? How much choice do you want to give the players – this can be crucial if there is a system mastery challenge where some options are better than others. Is the research order known to the players? If its known it can be a spoiler, if it is not known the uncertainty will change player strategies. Can steps on the tech tree be skipped? If players do screw up, is there a catch up mechanic? How much control do the players have over the research effort? Technology developments can be great rewards and motivators. Its a way of adding complexity to the game as the players master the core rules of the game, by adding new capabilities to the game mix. Time is a constraint in megagames. You will only be able to process a finite number of game turns. If you make the tech tree too big, teams will never complete the end of the tree, and this may disappoint the players. This suggests you need to calculate the resource fountain or flow dedicated to research, against the cost of the options. You definitely want a playtest of the system. After several turns what does it look like for teams that focused on research, ignored research, or did a bit of research? Because technology can be used to change the game rules, you also need to consider how this change is reflected in game state information. All the other players and GMs need to be able to verify and understand the research outcomes. Keeping things simple is always a good idea. In real life, tech change tends to be evolutionary, not revolutionary. One thing I would not want to do, is to have one option in the tech tree that is a dominant strategy. Some teams will spot it, others may well miss it until it is too late. I usually have about four hours available for a megagame, and get through about eight 20 minute turns, after briefings and delays are taken care of. So I want less tiers of research than I expect game turns. I think the tech tree should be open knowledge to the players, especially as I want to run the game more than once. Because each team should have five players, that sets the upper bound of research effort each turn – five attempts to generate research points and buy technology cards. That means no more than five branches on the research tree. With the mechanics I have in mind, at the start of the game a player should be generating 1-12 research points a turn. By the end of the game, a player should be generating 2-24 research points a turn. This is a table I put together quickly, so the numbers might be fine tuned later. It has four tiers of research, although I might extend it to a fifth tier as well. There are two concepts represented in the cost/reward structure – diffusion of knowledge and diminishing returns. The first team to research a breakthrough pays the highest cost, but reaps the greatest reward in Victory Points. The costs diminish as the knowledge is spread throughout society, but the Victory Points drop more quickly to zero. This can be done by building a card deck, set in a prearranged order, so the cost of the top card is the highest cost, and so on down to the cheapest and last card. If a team focuses on maximising research, they should unlock most of the tech tree within five turns, granting them three or more turns to enjoy the fruits of their labours. A team focusing its efforts elsewhere, can catch up with a bit of effort. I do have some problems to work on. First, I need a way to make it clear who gets the privilege of choosing cards first (it could just be random). Second, because I need to keep the research card decks in one place, but my initial map design has multiple maps where research can be generated, I need to find a way to accurately transmit information about research (do I give the players cards or token chips, or rely on Map GMs to coordinate the information). Adding more units to a team’s force pool. Improving the capabilities of controlled units (e.g. rolling a d8 rather than a d6). Unlocking new types of units, such as the Colossi. Allowing the build of ancient wonders of the world. One option I am considering, is allowing a narrow thrust up the tree to unlock the Colossi at Tier IV or V. But all the branches of the tech tree lead to Colossi (each gives the Colossi a different capability). After all, making a game about giant steam bronze robots, and not letting the players use and enjoy such leviathans, would not be good design.